﻿ Free today, $99 tomorrow? After today, this Speed Training Workshop will cost you $99. That’s because Taylor is turning today’s Speed Training Workshop into a $99 course to sell on his website soon. 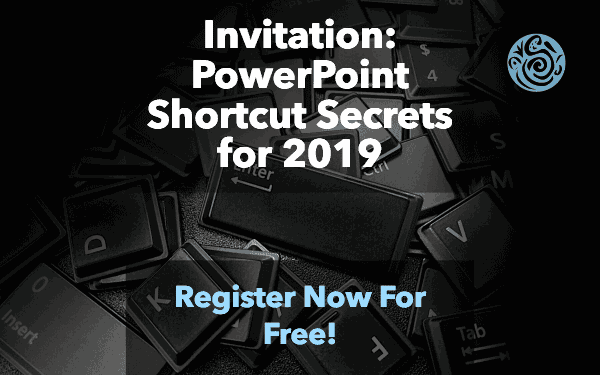 So if you are interested in learning Taylor's best-of-the-best shortcut secrets for 2019, I recommend signing up ASAP here. On top of that, all of these shortcut secrets are actionable too! After attending the workshop, you will know exactly how to speed up whatever you are currently doing in PowerPoint RIGHT NOW. So no more late nights at the office in 2019 with your slides, simply because you didn’t know how to use the right types of shortcuts to accomplish your tasks faster. To join today’s Speed Training Workshop for free before Taylor turns it into a $99 course for his website, I recommend clicking the link below and registering soon. P.S. A replay of today’s workshop will only be made available to registered participants. So if you can’t attend the workshop live but want to see the replay before Taylor turns it into a $99 course, simply register to attend here.